You can actually get more colours by mixing. For instance, you can get purple by mixing blue with pink. Purple can be used as a highlighter and dusted all over to make the face look less sallow. The powder is very fine and sheer. They don't give much colour when swatched. The yellow shade is too sheer for correcting my dark eye circles. Would probably use it to dust over the area after using another concealer/corrector. I couldn't really find a use for the blue shade so didn't try that. (Think I'll try the purple trick next time.) The pink shade gave a mild radiant glow which was all right. I was however, surprised by the green shade. The green is very sheer so it needs a bit of piling before it works on the redness from my acne that I was trying to get rid of. I packed it on with an eyeshadow brush and it blends beautifully. It did not give me full coverage but the redness was neutralised by at least half without leaving an ugly green patch, which most green correctors usually do. I actually really like it and think I would use it the most. 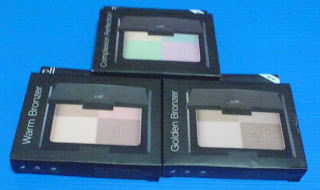 If you blend all the 4 colours together, you get an almost white powder that can be used all over the face. It helps to neutralise colours that shouldn't be there and make your face look more radiant. I tested it on the face without any makeup on. It goes on sheer without much coverage. The finish was nice, somewhat satin-ish. I did notice my face look a little bit brighter and healthier. Overall, I'm think I might repurchase this product. It's not superbly good but it's still fun to have. The green shade did come in handy for me but I'm not sure it's going to work for those who have plenty of redness in their skin since it's sheer. If you feel you have a lot of correcting (of redness or for correcting dark eye circles) to be done, you might be better off looking for another alternative compact/concealer that provides better coverage. 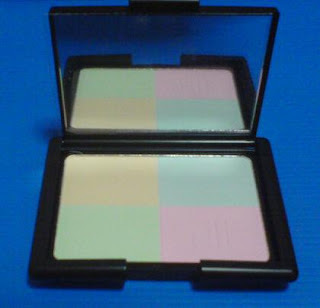 However, if you just want to try out what a corrector compact (or complexion perfection compact as named by E.L.F) is like or you would like your correctors and loose powder to be in one compact for convenience, this could be what you are looking for. I really like these but I think they are too shimmery to contour the face. They are however, very nice to use as highlighters/bronzers to dust on your cheekbones or all over to give it a sunkissed glow. They are shimmery when swatched but when on the face, it gives it a nice glow (with the shine but without the shimmer bits). I prefer Golden Bronzer as it's the lighter of the two and suits my skintone better. 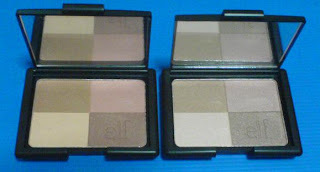 Warm Bronzer would probably suit you if you are slightly darker with more of a medium to dark skintone. For more photos/swatches of these, you can check out this link. I know the blush in the Warm Bronzer looks really peachy in the swatches photos in the link but mine's not really the same. Mine's more shimmery than pigmented.